New revision is now available. Fully revised and re-edited. HTML5 web applications are now capable of matching or exceeding the scale and sophistication of desktop applications, but with the unique advantage of running natively inside the web browsers on billions of desktop computers, phones, TVs and tablets. Browsers have introduced new standards-based APIs allowing web applications to (amongst other things) store data offline, retrieve data from the server dynamically, spawn background processes and interact with the filesystem. The jQuery library has eased the pain of interacting with Document Object Model, and therefore writing applications that dynamically respond to user interaction. The HTML markup language has been overhauled and extended to provide more semantic meaning, and many additional elements and attributes. An introduction to the HTML5 markup language, and how it differs from HTML4 and XHTML. An introduction to jQuery selection, traversal, manipulation and events. An in-depth look at the Web storage and IndexedDB APIs for client side data storage. A guide to implementing offline web applications with the Application Cache API. A guide to the use of Web Workers in web applications. An introduction to AJAX, and the jQuery API supporting AJAX. An introduction to Server Sent Events and Web Sockets. 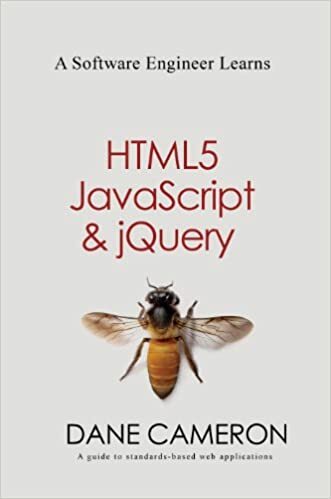 This book is intended for anyone with at least a superficial knowledge of HTML and programming (in any language).